How can I share log in details in a secure manner? If you are a Premium Support customer then you may want us to log into your site to assist with an issue. Emailing passwords is not the safest practice. There are better ways to do it. Never send a password by email. Never send us your own login details (create a new temporary account). Always delete the temporary account when we’re done helping you. Make a full website backup before we work on it. WordPress provides a way for you to give us admin access without emailing a password. 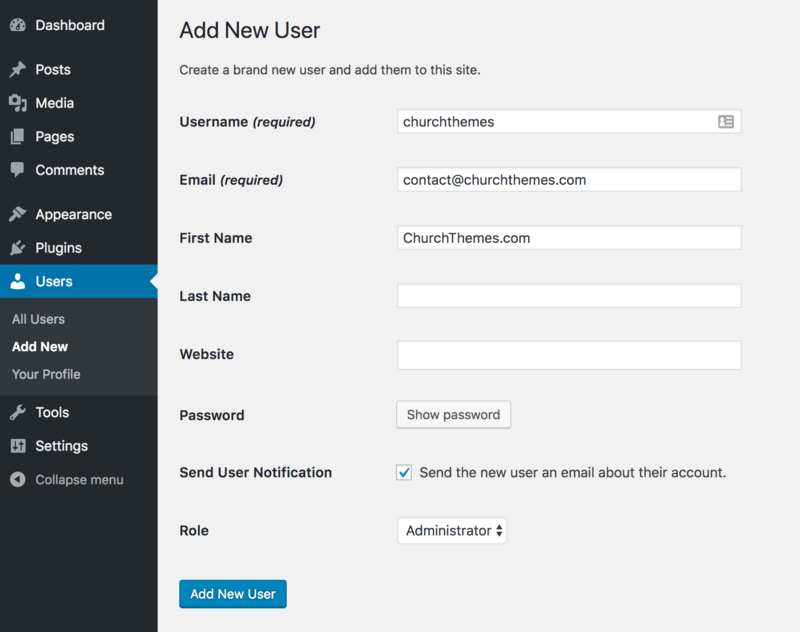 Go to Users > Add New in WordPress to create a temporary account for us. Leave Send User Notification checked. Click Add New User then tell us you’ve made an account for us (don’t send the password). Make a reminder to delete this account when we’re done helping you. WordPress will email us a link that we can click to choose a new password. This way the password itself is never sent via email. The link will expire and we will not store the password. Instead, we’ll log in and choose “Remember Me”. You’ll then delete the account when we’re done. On rare occasions it may not be enough for us to log into your WordPress site. In a case like this we’ll ask for access to your site via FTP or your hosting control panel so that we have access to your WordPress installation’s files for technical troubleshooting. Log into your hosting account to create a new user for us (for FTP or your control panel if it has a file manager). Your web host should be able to help if you’re unsure how to do this. Please create a new user and do not send us your own account details. Go to onetimesecret.com then enter the account and FTP connection details we’ll need to log in. Set “Passphrase” to the top-most License Key listed on your Account Overview. It will be used to encrypt the details temporarily stored by onetimesecret.com. Click Create one-time secret then email the resulting link to us (do not send the passphrase / License Key). Make a reminder to delete the temporary account when we’re done helping you. We will click the link then use your License Key (which only we and you should know) to decrypt your FTP or control panel access details. onetimesecret.com will expire the link and delete your details when we click the link. We will log in to help with the issue then you can delete the temporary user account.